I have been playing with these 2 polishes for the last week or so and I am sad I hadn't been using them sooner. I have been using them for stamping, nail art, and as base colors for glitters. These are classic colors that can be a staple in any collection. I used 2 coats when using them as bases and they applied perfectly. The dry time is amazing with these and I was ready to go with adding my glitter topper in a matter of a few mins. If you want to see all the fun things I did keep reading. This is a double stamping I did with Black out. 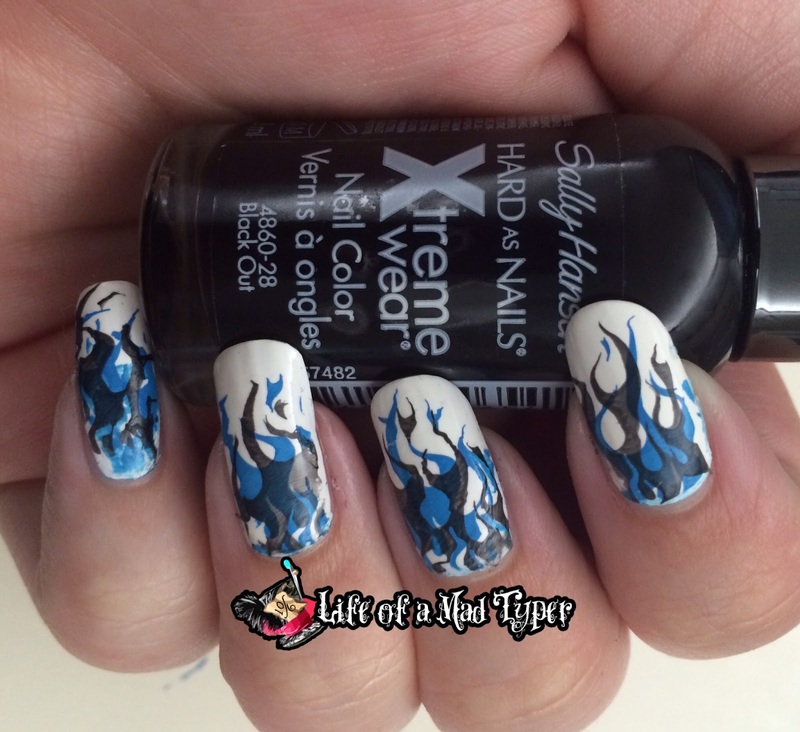 Its not super opaque when stamping but would be perfect when trying to get the flames like I did above or as the outline when stamping. With white on the quick application and clean up allowed me to get in some stamping practice. I had aparently gotten some cuticle oil on my nails so the image didn't fully stuck but I still like how it turned out. 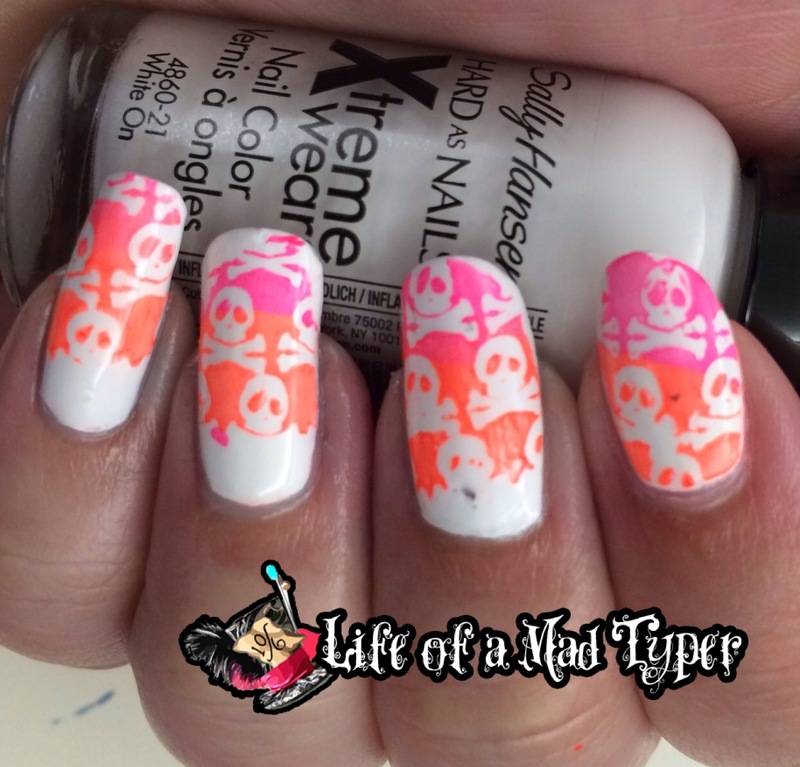 I have been trying out a ton of white polishes trying to find my perfect white base and I keep finding these amazing whites from different brands but I am really loving the extreme wear with the dry time being so quick and only a 2 coater. Black out has me itching to stamp some pastels or lighter metallics that I can't do over lighter colors be pronounced as I would like them to be. I had a thought that I have not been using black as much as I did when I was younger. You may not know but I am all goth at heart but I am finding my love for the neons and other colors as I age, but when I was in high school I mostly wore black. It was my staple of every outfit and I love how well it brings my paleness to attention. Black out has rekindled my love for darker colors. What is your favorite color from the Extreme wear line? I definitely love the black, where are those skull stamps from? They would go great with my Halloween costume! I am going as a Sugar Skull, and I definitely will be purchasing! Thanks for sharing! !